Ice-out fishing is an exciting time for anglers. When the ice disappears, fish go on the feed. But if you plan to fish from a boat with an outboard or sterndrive, a few pre-launch steps are in order before shoving off. Boat mechanics see all manner of problems in spring. Fishing boats have been in storage all winter or stored on the trailer outdoors. 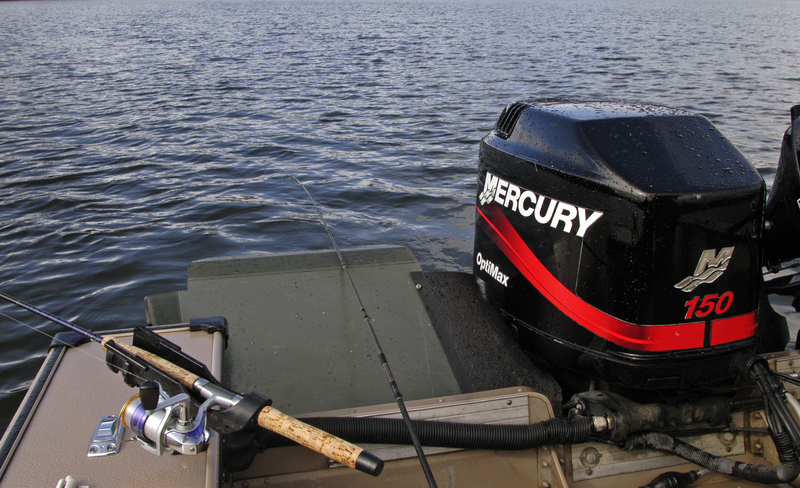 Some anglers forget to check their engine oil. Others never notice the fishing line wound around the prop shaft line that can cut through the waterproof shaft seal, in turn ruining the bearings and gears in side. Romig is referring to spring fire-up, when fogging oil used to winterize the engine “can smoke like the dickens” and foul the plugs. Anglers often forget to bring a spare set of plugs along. Romig recommends getting a tune-up in spring after the first launch and packing spare plugs when the boat first goes in the water. Frigid waters also present a potential problem if anglers get impatient about leaving the dock. Mechanics advise letting four-stroke engines warm up for four or five minutes before accelerating out onto a lake or river at this time of year. Four stokes have an oil reservoir, whereas two-strokes are lubricated by mixing oil in with the fuel. Ethanol is another issue. Fuel stored all winter without being treated with an ethanol stabilizer stands a good chance of going bad. The ethanol separates from gasoline and attracts water, Mullen said. That water can become excessive, resulting in an engine that doesn’t run. Fuel can be tested, he said, with a small test kit that is sold at Briggs and Stratton dealers. The test will indicate whether the fuel is good or should be discarded. Mullen generally recommends starting the season with a fresh tank of fuel. Starting batteries also should be checked, too. Make sure that they are charged and ready to go. Adding water to cells might be required. Check any wiring to make sure it’s intact, and double-check connections for corrosion. Having a set of jumper cables along is not a bad idea. In fact, boat anglers would be wise to run down the usual spring checklist that most boaters use. That includes checking water, fuel and vent hoses, both their connections and overall condition. Make sure there are enough life-jackets onboard and dock lines and bumpers. A spare anchor and anchor line also can come in handy. Boat trailers need a thorough once-over to make sure tail lights work and the tire pressure is correct. Here are questions to ask: Do the wheel bearings need to be lubed? Are the brakes still OK? Maybe the winch could use a shot of oil this year. That’s not a bad idea for drain plugs too, which often get pulled so bilge water can drain out of the hull. Forgetting that simple step is likely to result in very bad day — no matter how good the fishing. This entry was posted in Uncategorized and tagged Boat, Boating, Briggs & Stratton, D&R Sports, Fishing, Four-stroke engine, Ice-out, Mercury, Outboard motor, Van's Sport Center. Bookmark the permalink. jonsok; You bet. The ethanol issue can be troublesome.